"This is an inspiring book. All of us, if we honestly look into our harts, we know that there have been moments when we have failed. Failed ourselves, failed our family and failed our communities. This book tells you that failure should not be the cause and reason for your demise." 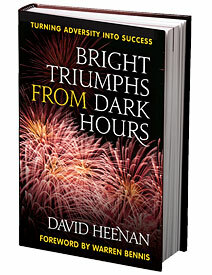 To order your copy of Bright Triumphs by David Heenan, please click on a link below. Thank you! If you would like to place a mail order directly through University of Hawaii Press, our Mail Order Customer Representatives are available to answer your questions from 7:00 AM to 4:00 PM (Hawai'i Standard Time), Monday through Friday. University of Hawai'i Press accepts credit cards, checks or money orders. We accept VISA and Mastercard. All prices are quoted in US dollars. Prices are subject to change without notice. We do not ship COD. GST should be calculated for all Canadian orders. There is an additional fee for shipping and handling.